Derbyshire V Northhamptonshire. 'Derbyshire bowler, Matt Critchley takes the applause from team mates at the fall of Northampton batsman, Buck, caught by Billy Godleman for 12. Derbyshire leg-spinner Matt Critchley recorded his best figures in first class cricket to leave the Division Two County Championship match against Northamptonshire at Chesterfield in the balance. 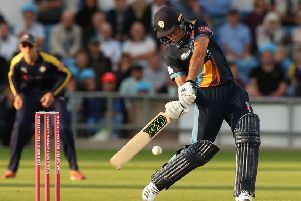 Critchley took 4 for 88, including the wicket of Northants skipper Alex Wakely for 108, and seamer Tony Palladino finished with 4 for 33 as the visitors were dismissed for 289, a lead of 29. They looked on course for a more substantial advantage when Wakely and Steven Crook, who made 60, shared a sixth wicket stand of 120 but Critchley had Wakely caught at slip and the last four wickets fell for only 29. Ben Slater and Billy Godleman started well but Ben Sanderson had Godleman caught behind for 16 and at tea, Derbyshire were 46 for 1, 17 ahead.